"White jack" redirects here. For the naval flag, see white ensign. 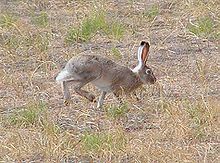 Wikimedia Commons has media related to White-tailed jackrabbit. ^ Hoffman, R.S. ; Smith, A.T. (2005). "Order Lagomorpha". In Wilson, D.E. ; Reeder, D.M (eds.). Mammal Species of the World: A Taxonomic and Geographic Reference (3rd ed.). Johns Hopkins University Press. p. 205. ISBN 978-0-8018-8221-0. OCLC 62265494. ^ a b c d e f Smith, A.T. & Johnston, C.H. (2008). "Lepus townsendii". The IUCN Red List of Threatened Species. 2008: e.T41288A10413649. doi: 10.2305/IUCN.UK.2008.RLTS.T41288A10413649.en. Retrieved 27 December 2017. ^ Kline, P. D. (1963). Notes on the biology of the jackrabbit in Iowa. Proc. Iowa Acad. Sci, 70, 196-204. ^ a b "White-tailed jackrabbit (Lepus townsendii)". ARKive. Smithsonian National Museum of Natural History: North American Mammals. Archived from the original on 2013-10-29. Retrieved 2013-09-01. ^ a b c d e Gosline, Anna (2001). "Lepus townsendii: white-tailed jackrabbit". Animal Diversity Web. University of Michigan. Retrieved 2013-09-01. ^ a b c "Lepus townsendii: White-tailed Jackrabbit". 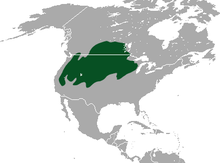 North American Mammals. Smithsonian National Museum of Natural History. Retrieved 2013-09-01. ^ "thestar.com - The Star - Canada's largest daily". thestar.com. Retrieved 23 April 2018. ^ Jackson, H.H.T. 1961. Mammals of Wisconsin. University of Wisconsin Press, pp. 504. ^ Lim, B. K. (1987). Lepus townsendii. Mammalian Species, (288), 1-6. ^ Olendorff, Richard R. (1976). The Food Habits of North American Golden Eagles. American Midland Naturalist (The University of Notre Dame) 95 (1): 231–236. ^ Errington, P. L., Hamerstrom, F., & Hamerstrom, F. (1940). The Great Horned Owl and its prey in north-central United States (Vol. 277). Agricultural Experiment Station, Iowa State College of Agriculture and Mechanic Arts. ^ Berger J (2008). "Undetected species losses, food webs, and ecological baselines: a cautionary tale from the Greater Yellowstone Ecosystem, USA". Oryx. 42 (1): 139. doi: 10.1017/S0030605308001051. ^ Gunther, Kerry; Renkin, Roy; Halfpenny, Jim; Gunther, Stacey; Davis, Troy; Schullery, Paul; Whittlesey, Lee (2009). "Presence and Distribution of White-tailed Jackrabbits in Yellowstone National Park". Yellowstone Science. 17 (1): 24–32.